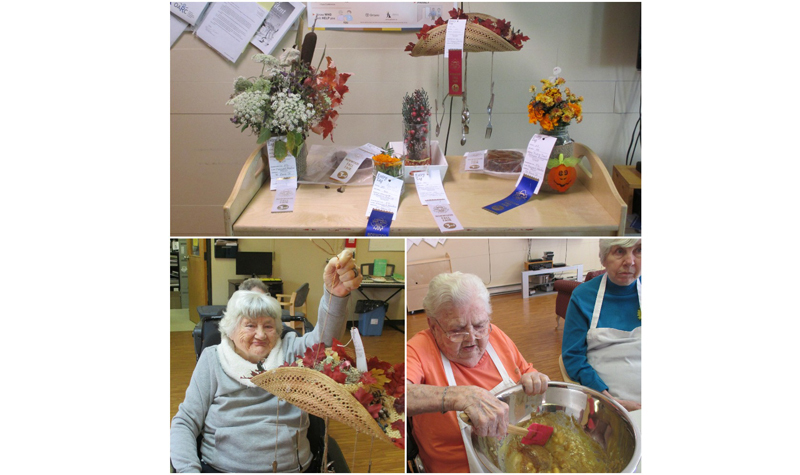 Not only did Pleasant Meadow Manor residents have a lot of fun making crafts and baking treats to enter in contests at the Norwood Fall Fair over the Thanksgiving weekend, seven of their 22 entries won ribbons. This year marked the 150th anniversary of the Norwood Fall Fair, and 22 residents worked with staff members to complete a variety of entries for the fair’s contests, which included artwork, needlecraft, baked goods and horticultural entries. Pleasant Meadow Manor residents who were awarded ribbons this year included Violet Davidson, Effie Reid and Sharon Storm. Violet’s entry, a straw-hat wind chime, took first place in the crafts category, and Effie’s cake and Sharon’s carrot muffins earned ribbons in the baking category. In what has become a yearly tradition at Pleasant Meadow Manor, residents decide what they want to enter in the fair, and life enrichment staff members work with them to complete their projects. Many residents start their projects in early September, and by the time the fair rolls around in October their entries are ready. While Pleasant Meadow Manor doesn’t organize trips to the fair, many residents visit the event each year with their families, says life enrichment co-ordinator Chris Garden. But whether or not residents decide to attend, they always enjoy working on their projects and waiting to hear if they won ribbons, she adds. “We do this every year – it’s a big event for Norwood and the home is just buzzing with family members and it gets our name out in the community and the residents will tell their family members to look out for the things they make,” Chris says.